The original Warriors Orochi 3 came out two years ago. Tecmo Koei recently released an updated Ultimate version, which boasts new levels and a few additional characters. However, the graphics don't seem upgraded as the character portraits seem grainy and there is still a lot of pop-in for the enemy troops. The rest of the additions are pretty solid though. The story follows from the second game, but it's not really required to have played it in order to understand what's going on. Basically, the heroes of Dynasty Warriors and Samurai Warriors were transported to another world where they coexist and defeat an evil entity called Orochi. A while after their victory, this world is threatened by the appearance of a multi-headed hydra. You start at the three surviving heroes' assault on the monster. It doesn't go so well, and you end up being saved by one of the mystics. Her name is Kaguya, and her power allows you to travel through time to recruit all of the other Warriors characters and have a chance at beating the hydra. I like the presentation of the story. It's a nice unified plot, and has a good excuse for so many levels. You can only jump to places that a recruited character has been, so as you gain more people, you also open up more levels. Some stages have a character die. Later you will unlock special stages that allow you to change their fate, and recruit them to your cause. While not the deepest or best plot I've ever seen, the story mode is fun and well done. There's also several guest characters from other franchises, like Ninja Gaiden and Bladestorm. For the Ultimate edition, they even added Sterk from Atelier Rorona and Sophitia from Soul Calibur, among others. It's a great excuse to put others in a fun hack and slash game, and I approve. The core fighting is pretty much the same as Dynasty and Samurai Warriors. You get a regular attack and a charge attack that changes depending on what point in the combo you use it. There's also a special attack that takes some of your musou meter to use. Some are attacks, while others are power-ups or something similar. Instead of the two weapon system from the later Dynasty Warriors games (which came out after the original Orochi 3), you have 3 characters that you can switch between. One new feature in this system is the ability to summon the other two to fight alongside you. While they won't recover health and musou when deployed like this, they can attack enemies and allow you to use your multi-person musou attack. However, my favorite improvement is the Scroll of Enlightenment. Picking one up gives a temporary buff where any enemy killed gives an experience scroll. You get a ton of experience this way and it's a lot of fun to see so many scrolls and so many level ups happen so quickly. The only problem I have is I see no indication of how long it lasts. Getting a lot of levels helps with the other new addition, "promoting". Similar to other games, this allows you to start a max level character over at level 1, but with higher stats and more skill slots. You can do it a maximum of 10 times per officer and end up with ridiculously overpowered characters. Besides the story mode mentioned above, there are three other modes. The first one I'll talk about is Duel mode. It basically turns the game into a fighting game (kind of like the first Dynasty Warriors), where you will face off 3-vs-3. You can also equip and use special cards that activate different abilities. The mode isn't bad, but it's fairly uninteresting. It's something you'll likely play once for the novelty of it, or a few times for the trophies. There's also a battlefield edit mode, which allows you to change any completed battle by altering lines, enemies, allies and participating officers. While it could be pretty fun, I'd rather have a more robust level creator. I can rarely remember which battle took place where, since the levels are all corrupted by Orochi and end up looking similar (save the beach level), so starting by choosing a level to edit didn't help. It's kind of fun to change lines and stuff, but it doesn't last. If it were more open, like picking a field (and showing you the map), picking a troop type and selecting where officers went (and it would place the troops automatically), it would be a blast. As it stands, it's another novelty that you might try once and then forget about. The last mode is called Gauntlet. You will start with 5 characters (there are some pre-selected or you can choose any you have unlocked), which cannot be changed until others are unlocked in this mode. The stages have random "Dragon Portals" which must be activated, and do a variety of things, like summon enemies, heal you, or give items. One of them will be the exit for the stage, which you must find to complete it. As you kill enemies, they will get much stronger, and any named officers you defeat will be unlocked so you can use them in Gauntlet mode. When you beat a stage, you get a crystal that can be used to unlock another stage. Gauntlet mode is pretty fun, but the random nature can make it near impossible to complete stages. I was able to beat the tutorial very easily, but it took me 3 or 4 tries to actually beat the first stage. Enemy levels shoot up very quickly, so it become important to find the exit first, then get some experience, items and defeat enemy officers. The biggest knock against the mode is the uneven difficulty. It's fun, but can get downright brutal if you aren't lucky. One piece of advice from my friend DTJAAAAM: get and use the formation skill that allows you to see where the exit is. The mode will be much easier then. Also, you can edit the colors of officers that you are using in Gauntlet mode, which is cool in any game. There are a lot of stages in the original Orochi 3, and Ultimate about doubles the amount. Since each battle takes about 10-20 minutes (more with loading, dialogue and preparations), I would say it's about 50 or so hours to do all of the story missions. Add in the time for Gauntlet mode, and you will easily get your money's worth from the game. You'll likely get some replay out of Gauntlet mode, since you're supposed to go through it multiple times to get all the good stuff. If you are a trophy hunter, you will be in it for the long haul. If you have a save file for the original Warriors Orochi 3, you can save yourself 20 or so hours, and jump into the new stuff with your leveled officers. If you are a fan of Dynasty or Samurai Warriors (or even the upcoming Hyrule Warriors), then I'd easily recommend Warriors Orochi 3 Ultimate. Even if you have played the original release, there is enough new content that I would still recommend picking up the game. Some of the visuals look a bit grainy, but the game is fun and there are many an hour to be spent clearing the story. The first Danganronpa was a pleasant surprise. It had a unique premise and I got sucked into the story. Since I loved the first game, I was excited to see the sequel was also coming to the US, and sooner than I thought it would. I was very eager to check it out and see if it could top the first game. Although in a different setting, Danganronpa 2 has a flow and look very similar to the first. You start in Daily Life until a murder is discovered. Then the game enters Deadly Life, where you must investigate the scene(s) of the crime and collect evidence and testimony. Afterwards, all survivors make their way to the Class Trial where you have to figure out who committed the crime and how. Once the culprit has been found out and voted on, they will be brutally punished. The concept of the game is still great. As you go along and get to know the characters more, it can be painful to watch them drop one after another until the conclusion of the game. Another nice touch is the UI colors (for dialogue boxes and such) will change color depending on the section of game you are in (Daily Life, investigation or trial). First, I'll start with the positive changes. The map is better and easier to navigate and understand. While you can use it to fast travel, you actually get rewarded for walking to your destinations. Taking steps, investigating things and talking to people will help you level up. Your level will determine the maximum number of skills you can equip, so there's no reason not to get some. Some of the other changes are just average, although that might sound scarier when you realize there was only one real positive change. Anyway, you now have a Tamagatchi-like pet in your student handbook that you can give presents to and clean up after it. After a certain number of steps, it will grow up into a different animal. Once you take even more steps (and prevent it from dying) it will leave and give you some Monokuma coins and presents. It's not really a bad thing, but it doesn't feel necessary, so it ends up being average. They have also added hidden Monokumas around each chapter that you have to find. Some are really well hidden, and each gives 10 Monokuma coins when you find them. There's no real reason for them, except to give you something else to do/ miss as you make your way through the game, and a trophy or two. One of the new games in the Trial section is okay as well. Called "Logic Dive", you will race down a cylindrical field while gathering your thoughts. At three separate parts, there will be a question that you choose an answer for by going to that side. If you choose correctly, you will continue on. If not, you fall off and are set back before the question so you can do it right. It's not terrible, but it doesn't feel like it needs to be there. It certainly makes Danganronpa 2 feel more "video game-y" than it did previously, if that's what you wanted from the series. Now on to the changes or additions that I didn't like, and I'll start near the top of the list. One of the new mini-games during the trial is called "Rebuttal Showdown". It's a one on one argument, where you will cut down your opponent's statements. Truth Bullets become Truth Blades and are still used for the same purpose. A nice idea, since you will literally cut down their argument, but not good in execution. Since you spend your time swiping or using the stick to cut their statements, you aren't paying attention to what they are saying. Most comments take multiple swipes, so you might accidentally hit a key statement while trying to make headway. Hitting a key statement basically sets you back the whole section, and is really annoying. You need to use the correct Truth Blade on a key statement to end it. If you remember the previous statement that it's hard to listen to what they are saying and you see the folly of this addition. You'll have to figure out before they start which evidence you will likely need because you won't have time while it's going. Ugh. Hangman's Gambit returns with a new twist and is ironically named "Improved Hangman's Gambit". instead of just picking the correct letters to spell out a word or phrase, you have to play a matching game. Different letters will float across the screen and you have to match two of the same to make it bigger. The bigger letters can be exploded (if you don't need them) or taken (if they are). Big letters don't stick around very long, and will hurt you if they explode on their own. If a letter touches a letter that isn't the same will also result in damage. The word or phrase must also be spelled sequentially. The whole order is random, so you can easily get screwed out of health if it wants to put a mismatch close together, or maybe not give you the first letter you need for a minute or so. Not only does it make the no damage trophy way to difficult to get, it's also really annoying in general. It's another change that I feel was to make the game feel more like a video game, and wasn't necessary since the first game was so good. So despite the name, Hangman's Gambit was not improved at all. The story for Danganronpa 2 takes longer than the first. Thankfully, it didn't drag on, and the pacing was pretty good. The game is also harder. The trials seem more strict and it was more difficult for me to figure out what evidence they wanted presented where. Some of the added difficulty comes from the new and updated mini-games mentioned above. Overall, the story was pretty good, although not as good as the first, and it was harder to figure out "whodunnit" until close to the end. Personally, I liked figuring it out sooner, as then I had an actual sense of accomplishment instead of just waiting for a twist. While I can't go into specifics on the story, it did have some annoying parts and characters, but I cared about more of the characters than I did in the first game. Like School mode in the previous game, there is an Island mode here. It mostly allows you to clean up the trophies and skills while interacting with the characters and squeezing more playtime out of the game. It's still fun, but the core game annoyed me enough that I didn't want to spend much extra time with it, which is the opposite of the first Danganronpa. 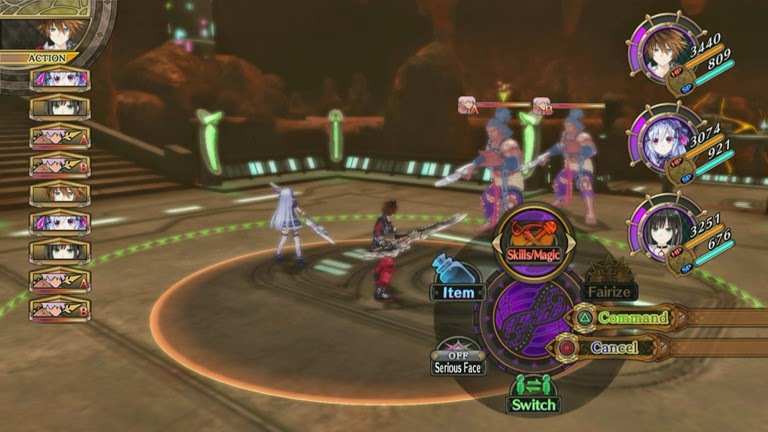 There's also a game where you play as Monomi and fight the Monobeasts, which is hinted at in the story. The game is okay, but make sure you read the controls first. There's no tutorial, and the game was pretty weird so it took me awhile to figure out what to do. Like half of the stuff in the game, it's not bad, but doesn't feel like it needed to be added. So, would I recommend the game? If you really liked the first, and want more of the story, it is worth playing. You might want to put the "action" difficulty down to make the newer mini-games less horrible. The story isn't quite as good as the first, but I think the characters are better. The additions feel like they wanted to make the game more video game-like than its predecessor, which I think was very unnecessary. I really wanted to like it, but Danganronpa 2 was disappointing. People looking to get into the series should stick with the first and enjoy that. Akiba's Trip: Undead & Undressed follows the story of your protagonist and his friends as they fight to rid their beloved Akibahara from Synthesters, which are effectively man-made vampires. The hero is turned into one at the outset of the story, and must use his new strength to stop the rest. How do you stop a vampire? Get sunlight on its skin. So, you and a partner will fight enemies and ultimately strip off their clothes to expose them... to the sun. Before the story starts, you will name and clothe your character. At first, you don't really have many clothing options, but you will get plenty throughout the game. Because of this, you will mostly be playing as a silent protagonist. You do get to make numerous dialogue choices during the game, which affects who partners with you, the affection level of the others toward you, and even the ending you receive at the end of the game. The ending you get will offer different unlocks, including player models that can be changed when starting a new game +. Akiba's Trip is mission-based. The story has you run to various areas of the map, usually fight some bad guys, then return for more dialog. The areas can be pretty small, and there is loading as you travel between each one. Thankfully, the map can be used to quick travel, saving you a lot of time. The only real complaint I have about moving around everywhere is that you have to be careful not to run into others. If you do, you bump into the person, making them yelp and both of you stumble for a bit. It doesn't really hinder gameplay, but it is annoying, especially in the more cramped areas. The fighting in the game is pretty unique, but has some resemblance to Clan of Champions. There are three attacks, one for low, mid, and high, and each will damage clothing on the corresponding place. You will only do damage to clothes, so there isn't much reason to keep hitting an exposed body part. Once the durability of the clothing item is down, you can hold the button to attempt to rip it off. If multiple articles of clothing are able to be ripped, you can chain strip with correct button presses and timing. Chain strip enough and you can even activate a super move that will remove their underwear (don't worry, they will be covered in light)! It's actually pretty fun and amusing to do so, plus it nets you underwear that you can equip. As a nice touch, there is even a piece of equipment that changes what animations you do when tearing off clothes. While combat is fun, it can get frustrating when fighting many enemies. One on one fights are easy. Two or three enemies is fairly manageable too, especially if you have a partner to even things out. There are a few fights against four or more, which can get hard. Enemies like to dodge a lot, and they can easily take advantage of you not targeting them, or when their friends get a hit in. Targeting an enemy is automatic, which leads to its own frustrations. Using counter attacks helps some, but it's no real substitute for having some kind of area of effect special attack. Finding the weapon type that works the best for you will also help, as they each have strengths and weaknesses. There are four kinds of weapons- fist, sword, heavy and long- and many variants within. Weapons and clothes can all be maxed out at the damage/defense cap, so you can pick your favorites and not have to worry about it needing to be replaced. The main quest of the game takes a few hours to complete, but there are a lot of side quests to help pad that out. Usually, they are an excuse to beat up some more Synthesters, but there are occasional fetch quests or ones that involve the character's cellphone camera. There are also several endings, at least 2 per girl, and multiple difficulties, so there are good excuses to run through the game a few times. Plus, getting a girl's ending allows you to use their model for your main character when you start a new run through the story. On the normal setting, the game isn't too hard, but can get frustrating at a few parts. Usually it's when you get chain hit by a surrounding group, or when you are doing the sidequest to fight 48 enemies (there are two of these). The trophies are pretty standard, with making your way through the game, doing side quests and collecting various pieces of equipment making the bulk of the list. Of course there are some for beating the game on the different difficulties, too. There's even one for collecting the flyers that some NPCs hand out. It's neat that they put real stores in the game, and they even have ads for them on the loading screens. You can turn them off if you want, but I liked seeing them. For some reason, the ads didn't bother me, but it could be because they aren't ads I would ever see, since I don't live in Japan. It was actually pretty cool to see them! Akiba's Trip is a lot of fun. Fights are silly and rewarding, even with the occasional frustration. At first, I thought it was going to be more fan-service oriented, and that all the enemies were going to be women. That isn't the case, as the game is very fair in its treatment of the different sexes. There's also dual language support, so hopefully everyone can be happy. If you like quirky games, fun action games, or even just a fresh take on hunting vampires, I would strongly suggest playing Akiba's Trip.